Being between homes - currently living in a temporary apartment, with most of our things in storage - has me already thinking about decorating a new space, and missing our last one. Find a few of my favorite home-things below, with more on my shop page. P.S. At the bottom of the shop page is my Directory of places I shop online for fashion, home décor, and beauty products. after dreaming of a green velvet sofa for years, I bought mine (similar model above) during last year's Memorial Day Sale at One King's Lane. 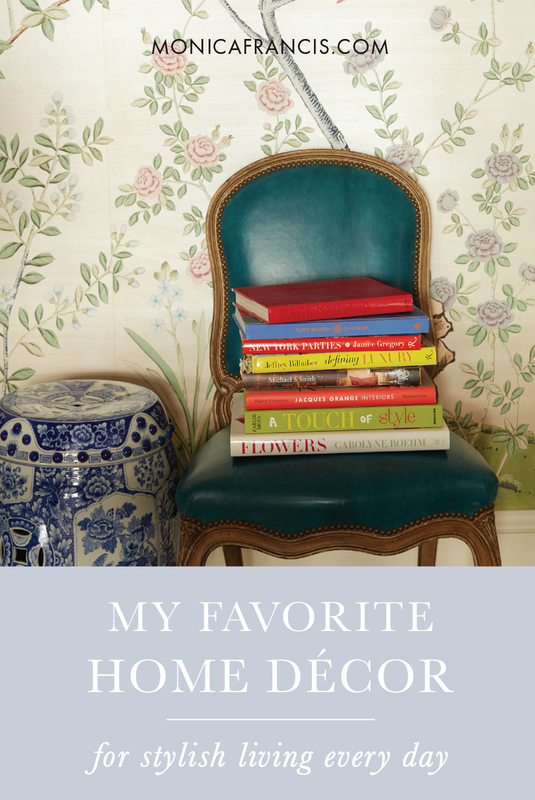 see my dream collection of coffee table books in this post. lovely for flowers and pretty enough to stand on its own. an ideal combination of form and function in my book. I hunt for these in vintage shops or on Etsy, and picked up a few in Florence! best of the best, and I also like everyday soy wax candles like these. and I think the best ones are by Redouté. we recently refreshed our bedding with a comforter from Snowe and this SFERRA duvet cover. It's a dream! holding cut flowers or serving beverages. a few years ago, we got a major deal on set of six oval-back chairs and we've found a spot for one or two of them in almost every room. wallpaper tends to be a love-or-loathe thing - I love it! pretty much anywhere - see more in this post!